The Antenna & High Frequency Research Centre specialises in the analysis, design and measurement of antennas and associated devices for wireless communications and medical applications. With more than 20 years of applied research experience and it has built an international reputation for innovative futuristic concepts and solutions to contemporary industrial challenges. On 1st January 2019 Technological University Dublin (TU Dublin), Ireland’s first technological university, has been formally established. DIT has become part of the new University, so has AHFR. All new content will be published under the new TU Dublin name, historic content will retain the mentioning of DIT. 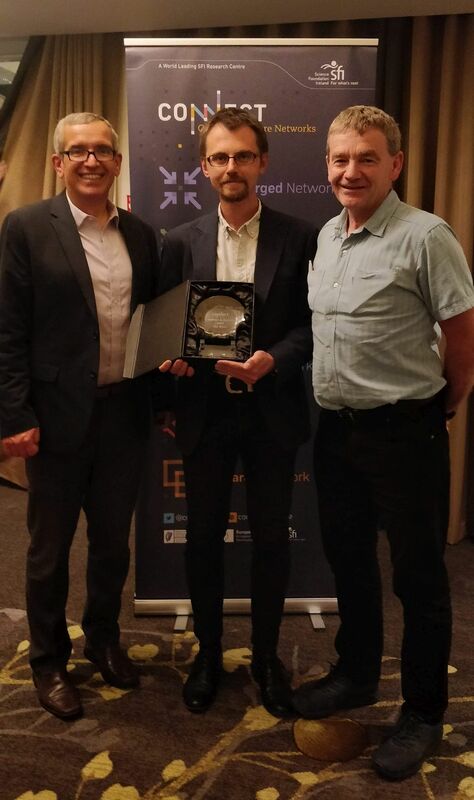 Dr Adam Narbudowicz, a postdoctoral researcher in Prof. Max Ammann's team at the School of Electrical & Electronic Engineering in DIT, has won the inaugural 'Tom Brazil CONNECT Excellence in Research Award' from CONNECT, the Science Foundation Ireland research centre for future networks and communications. Adam received the award for ground-breaking research on full-duplex radios, which could lead to more secure wireless communications, and networks capable of supporting many more devices at one time. “A full-duplex radio doubles the communication speed of a wireless device as it can simultaneously transmit and receive signals – a feature currently not implemented in any commercial wireless product. Its benefits are so great that this research area is sometimes called the holy grail of telecommunications,” Adam explains. “This is a well-deserved recognition of Dr Narbudowicz’s ability to combine basic theoretical research with commercially-oriented investigation. 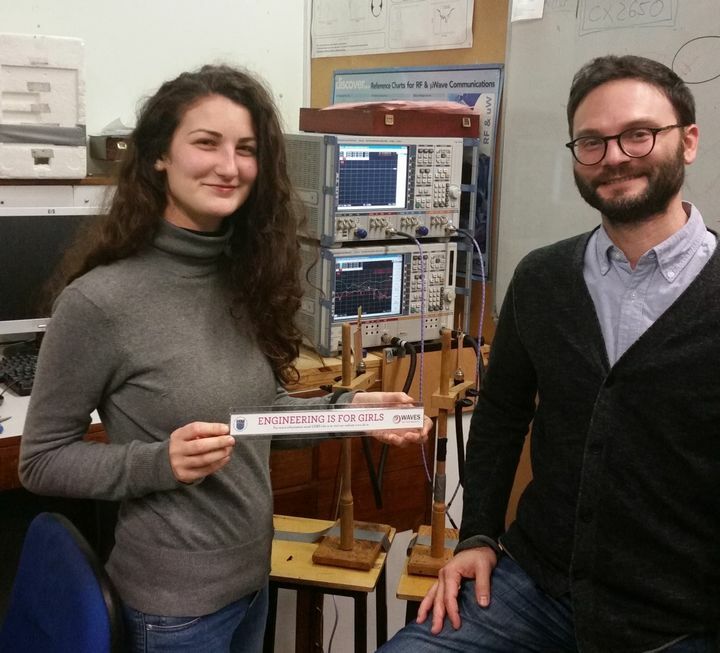 “This is his third award in under a year, having already won prizes at the International Symposium on Antennas and Propagation (ISAP) in Thailand, and just recently during the IEEE-EURASIP Summer School on Signal Processing in Italy. The Excellence in Research award was named in memory of Prof. Tom Brazil, a principal investigator at the CONNECT Centre in UCD, who died unexpectedly earlier this year. Adam is an EDGE research fellow. EDGE is a Marie Skłodowska-Curie COFUND Action offering prestigious fellowships for experienced researchers moving to Ireland. He has also held an IRC Elevate Fellowship. He collaborates with Prof. Nicola Marchetti’s complex systems research group in Trinity College Dublin. He is also researching ways of improving security for Internet of Things devices, which are becoming increasingly common in homes and work places and is leading a project on radar to accurately detect drones. The work, conducted at Prof. Ammann’s Antenna and High Frequency Research Centre, has already won funding from Enterprise Ireland, and has been supported by the NDRC pre-commercialisation boot camp. A free half day CST training course will be held at the Dublin Institute of Technology, Kevin Street at 1 p.m. on March 27, 2018 in room KE4-39. This half day training course is focused on microwave component and antenna simulation, and will cover advanced modelling, meshing, solver choice, post processing and tips & tricks session as well as the opportunity to go over support queries during a dedicated time slot. 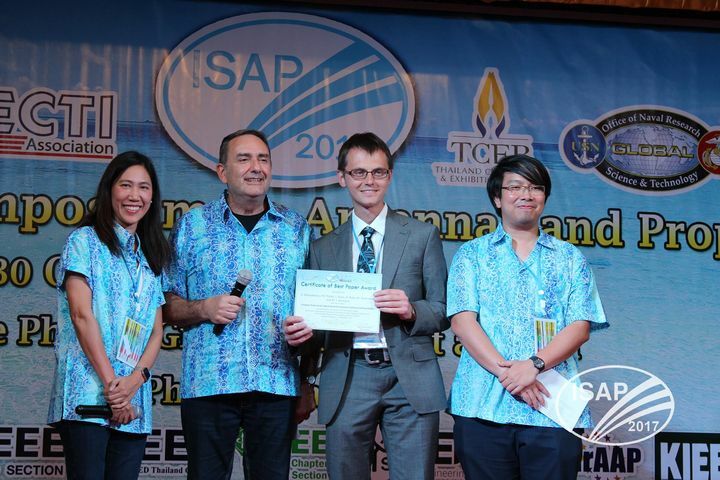 Dr. Adam Narbudowicz and Prof Max Ammann of the Antenna & High Frequency Research Centre, School of Electrical & Electronic Engineering, recently received a Best Paper Award during the International Symposium on Antennas and Propagation (ISAP), which was held in Phuket, Thailand on 30th October – 2nd November 2017. The paper “Compact Antenna for Digital Beamforming with Software Defined Radios” was an outcome of a fruitful collaboration between researchers from DIT and Gdansk University of Technology in Poland: Dr Lukasz Kulas, Dr Krzysztof Nyka, Marek Plotka and Mateusz Rzymowski. The International Symposium on Antennas and Propagation (ISAP) is considered the most renowned antenna and propagation conference in Asia and one of the most renown worldwide. The work of Dr Narbudowicz is supported by a new EDGE research funding scheme, which awarded Dr Narbudowicz with 220.000 Euro funding for the project "Wireless-SPIne – Wireless Security and Privacy for INtErnet of things". The project will study new techniques to enhance the much-needed security of wireless Internet of Thing devices, especially those operating from small nodes. The project will be conducted as part of CONNECT – the Science Foundation Ireland Research Centre for Future Networks and Communications and in close collaboration with Prof Nicola Marchetti and Dr Arman Farhang from Trinity College Dublin. 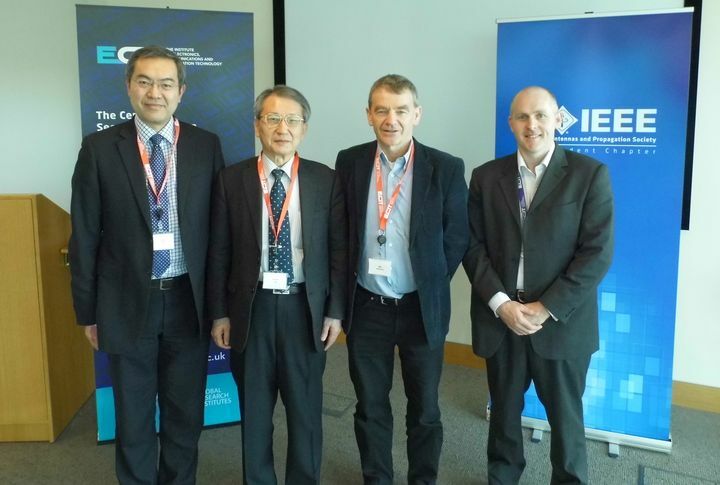 The Centre for Wireless Innovation, ECIT Institute, Queen’s University, Belfast and the Antenna & High Frequency Research Centre, Dublin Institute of Technology co-hosted a workshop on wearable and implantable antennas and propagation. The workshop took place in the ECIT Institute, Queens Road, Belfast, UK on 16th March 2017. Keynote speakers included Professor Koichi Ito, Life Fellow IEEE, Professor Emeritus and Visiting Professor at the Center for Frontier Medical Engineering, Chiba University and Professor Yang Hao, Fellow IEEE, Professor in Antennas and Electromagnetics at Queen Mary, University of London. Ms Fiaschetti carried out a 3 month research project as part of her second level degree in Biomedical Engineering, from the University of Rome 'La Sapienza', Italy. The project was entitled “Development of Multimodality Complex Anthropomorphic Breast Phantoms for Verification of Systems Accuracy and Reproducibility” and was carried out in both the Antenna & Frequency Research Centre and the Focas Institute. As part of this project Ms Fiaschetti developed a range of tissue mimicking materials which replicated breast tissue, primarily for microwave imaging but also tweaked them for a range of conventional multimodality imaging techniques. Following the development of these materials she characterised each of these materials in terms of their dielectric, acoustic, Magnetic Resonance relaxation and linear X-ray attenuation properties, to determine their suitability for the different conventional imaging techniques. She developed two types of 3D anthropomorphic breast phantoms, one with a simple mammary fat and fibroglandular interface and the other with a more representative complex fat and fibroglandular interface. Once these 3D anthropomorphic breast phantoms were built Ms Fiaschetti worked with the medical physicist in the local hospital in order to obtain images and 3D datasets of both phantoms with Ultrasound Imaging, Magnetic Resonance Imaging, X-ray mammography and X-ray Computerised Tomography. The year 2016 marks 20th anniversary of Marie Skłodowska Curie Actions, an EU initiative to fund cutting-edge international research. The action, named after the ingenious Polish scientist who worked in France, supports early-career investigators who lead trans-national projects at two different universities, located in two different countries. The Antenna & High Frequency Research Centre at DIT is proud to host Dr. Adam Narbudowicz, one of the awardees of the actions grant. Dr. Narbudowicz, also of polish origin, conducts research at both DIT’s School of Electrical & Electronic Engineering and RWTH Aachen University in Germany, aiming to provide enabling technologies for future wireless Internet of Things applications. 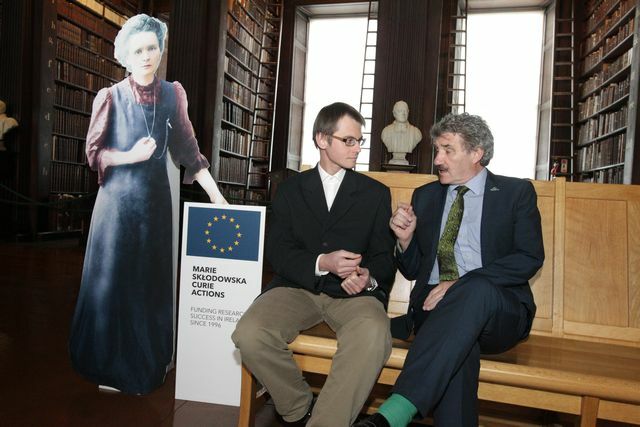 He was recently joined by Minister of State for Training and Skills, Mr John Halligan, in celebration of the 20th anniversary of the grant scheme, which took place in the old library of the Trinity College Dublin. This gave opportunity for a talk with the minister, in which Dr. Narbudowicz shared some of his insights and ideas on the future of wireless communication in Ireland. AHFR researcher Dr. Adam Narbudowicz was announced the winner of the Dublin Region Innovation Consortium (DRIC) Inventor of the Month Competition for March. Adam was involved in developing a low cost continuous radar system that measures the rotating speed of moving or stationary targets, enabling devices with hidden components to be serviced without being disassembled. The technology can be incorporated into radar systems or tracking devices. 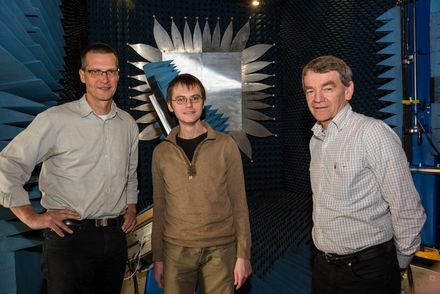 DIT’s Antenna & High Frequency Research Centre (AHFR) has a long standing and a successful collaborative partnership with the Institut für Hochfrequenztechnik (IHF) at RWTH Aachen University which is ranked 145 in the QS World’s Top Universities. This partnership was developed to a new level in January 2016 where Prof Max Ammann and Prof Dirk Heberling, Head of the IHF, oversaw joint discussions on closer collaboration across a range of project areas, which will benefit both institutions. The agreement secures access to the advanced measurement facilities at RWTH by AHFR. This includes a unique compact antenna anechoic chamber, capable of standard far-field antenna measurement (2 - 75 GHz) but also near-field measurements from (800 MHz - 12 GHz) and radar cross-section measurements. The chamber (in the far-field configuration) has a quiet zone of 1.2 m diameter, with amplitude variation below 0.4 dB. Since such measurement facilities and corresponding expertise are not available at any Irish university, this strategic collaboration helps to position AHFR and DIT among leading researchers in antenna and microwave engineering research in Ireland. The collaboration builds on an ongoing joint research project, funded by the Irish Research Council with support from Marie Curie Actions. Dr. Adam Narbudowicz is currently involved in a two-year secondment at RWTH Aachen, where he is developing circularly polarized and pattern reconfigurable antennas for future telecommunication systems. The work has also seen PhD students from RWTH Aachen attend courses provided in DIT as part of the Telecommunications Graduate Initiative (TGI).